In order to decrease the weight of the model, the ‘J12′ Superleggera collection is equipped with an automatic chronograph ETA2894-A2, which is a streamlined model of Caliber 7750. Sporty, with a light weight and masculine, the Superleggera were inspired from the ultra light racing cars of the 1950s combining the ultra-light articulated black rubber bracelet with a ceramic case. Materials: Matte black ceramic and aluminum. Bracelet: Ultra light, black, articulated rubber with steel automatic double-folding buckle. Case Back: With central disc in black sapphire revealing the words ‘CHANEL-Superleggera’. Movement: Automatic. It is certified as a chronometer by the COSC (Contole Official Suisse des Chronometers). 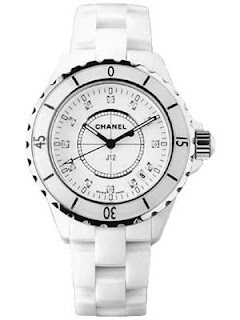 In 2000 Chanel launched for sale on the market the initial model of the unique Chanel watch line; the Chanel J12. 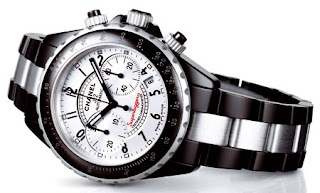 But the important stage of the Chanel J12 occurred in 2005 when the Chanel J12 designers made this watch be considered as a Fine Jewelry watch. In a few month this watch became the watch of all the “first times” . The world of boats was Chanel inspiration to give birth to the Chanel J12. It was again a victory for Chanel and some years later the success in this model resulted in the creation of a new version of the Chanel J12 passing from the deepest black, exclusively used up to then, to an intense opalescent white, obtained using a new high-tech snow-toned color. This model was improved not only for men but also for women who can enjoy a J12 with an extremely glamorous diamond version. Something to highlight about the Chanel jewelry watch was the incorporation of the tourbillon; the most sophisticated of all watchmaking complications . Arising the challenge of producing a fine jewelry watch of complicated nature, Chanel had the most experienced Swiss watchmakers to develop the exclusive ‘CHANEL O5-T.1’ movement. Ultra-thin ceramic bottom-plate (just 2mm thick), optical glass cage, 18-K white gold bridge are some of the exceptional features that take part of the Chanel watches mechanism. 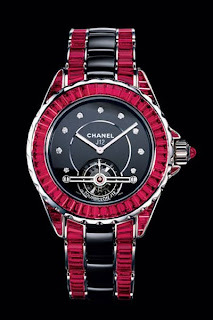 In 2006 the Chanel J12 Haute Joaillerie appeared on the watches market. The Chanel J12 Haute Joaillerie was composed by 605 baguette-cut diamonds which caused great success among clients that loved the Chanel codes (black and white, diamonds and ceramic) The ceramic was adopted by the watchmakers to give the timepiece a brilliant black and white union. This beautiful creation reflects the Chanel belief that white and black colors are a perfect match and also go with everything. A year later, the Chanel J12 Tourbillon Haute Joaillerie was created. The characteristics of this watch were: the dial of the watch ; two 0,3 mm ceramic plates as well as 9 index diamonds, the tourbillon appears in the head-turning with 568 baguette-cut rubies embracing the watch’s bezel, case and bracelet, white gold, black ceramic and also rubies. Today, the House of Chanel watches is still very much on demand due to a new generation of clients. The Chanel J12 is the first unisex watch for Chanel and it is characterized by clean lines and both masculine and feminine features, making it a watchmaking revolution. In 2003 Chanel introduced the Coco Mademoiselle and the Chanel In-Between Wear, for younger women.